For an easy meal or yummy lunchbox snack, you can’t go wrong with these Pea and Feta Fritters! Both regular and Thermomix instructions included. You guys should know by now that I love an easy Fritter recipe (check out these Broccoli and Bacon Fritters, Sweet Potato Fritters or this Cauliflower, Cheese and Bacon Fritters if you need some proof!) and I think that you are going to really love these Pea and Feta Fritters too. 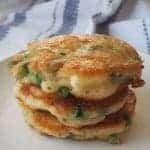 This is a great recipe if you are looking for an easy family meal and these fritters are also great for the kids lunchboxes – you can make them even smaller for the littler kids. They are also a great way of getting the kids to eat some extra veggies and you can easily add a grated zucchini or other vegetables to this recipe too. These Pea and Feta Fritters are simple to make regardless of whether you follow the conventional cooking or Thermomix instructions and the longest part is actually cooking the fritters in your pan. I like to use either extra virgin olive oil or ghee to cook my fritters as I find both of these help to give them a lovely golden colour and a bit of a yummy crunch. However you can use whatever oil you prefer. When putting this recipe together, if you find that your fritter mixture is a little too runny, simply add an extra tablespoon or two of self raising flour. You can also make these egg free – just add an extra 1/4 of a cup of water to help bring the mixture together. You can find more easy family meals in Family Dinners Made Easy and you can view our entire range of books, ebooks and lunchbox products here. This easy Pea and Feta Fritters recipe make a great family meal or lunchbox snack for the kids. These Fritters are freezer friendly and both regular and Thermomix instructions are included. Place the onion flakes, parmesan cheese, crushed garlic, self-raising flour and salt and pepper into a large bowl and mix to combine. Add the eggs, water, feta cheese and peas and stir to combine. Heat a tablespoon of olive oil in a large frying pan over a medium to high heat and use dessert spoon to scoop up the batter and place the fritter mixture into your pan. Use a spoon to gently spread the mixture into a circle between 1/2cm - 1cm thick. You should be able to fit approximately four fritters (or even more depending on the size of your pan) into your frying pan. Cook the fritters for 3 minutes on each side or until they are crisp and golden brown before transferring to a plate and covering them with foil so they stay warm while you cook the next batch. Repeat until all of the batter has been used. Place the parmesan cheese (cubed) and garlic cloves into your Thermomix bowl and mix for 10 seconds, speed 8 to grate. Add the onion flakes, self-raising flour, salt and pepper, eggs and water and mix for 10 seconds speed 4. Scrape down the sides of your Thermomix bowl and add the feta cheese (cut into cubes) and the peas and mix for 10 seconds, speed 4, REVERSE to combine. Heat a tablespoon of olive oil in a large frying pan over a medium to high heat and use dessert spoon to scoop up the batter and place the fritter mixture into your pan. Use a spoon to gently spread the mixture into a circle between 1/2cm – 1cm thick. You should be able to fit approximately four fritters (or even more depending on the size of your pan) into your frying pan.